Well must be a maritime curse! Jaydee's broken spar and now this. I launch this kite and it promptly took a nose dive! Really hard! It was really cold and I didn't check to see if my bridle was tangled before launching which is likely what happened. Its roughly 3/4" away from the center. My thoughts are to either use a patch made of red p-31 and run it an equal distance over to the left of the spine. Or to make a dacron patch similar to the r-sky reinforcement and run it all the way down to the tail. Any other thoughts or suggestions would be greatly appreciated. Moonie or tedlar tape will hold that for longer than you might think if you want something quick. CA and tedlar will hold up as well. Since you can sew and if you want to keep the kite, pull off the Dacron around the center T and use the R-Sky type T keel reinforcement to make a nice repair. It's roughly the same amount of work than to sew a 1/2" strip of Icarex and you will always see that and think you should have done something different. If you use seam tape on the back of the Dacron reinforcement (I do that) you'll only need to ZZ around the perimeter of the Dacron. The seam tape will hold the ripped fabric to the Dacron. For good measure,add a little CA along the tear seam on the back after the patch is in place. Ouch, that hurts! Yes, let's blame it on the Maritime winds. IMO a rectangular dacron patch would have to be too wide to be unobtrusive. What you could do is extend the upper edges of the diamond-shaped patch around the the center T hole to the seams between red and grey. Then insert a patch of either red or black P-31 and remove the original material above the mylar tail reinforcement. That may be technically quite challenging, though. A dacron patch in that shape might work, too, but may add too much weight. Total weight is the major concern here, as the balance would not likely be disturbed much by adding material between center T and tail weight. 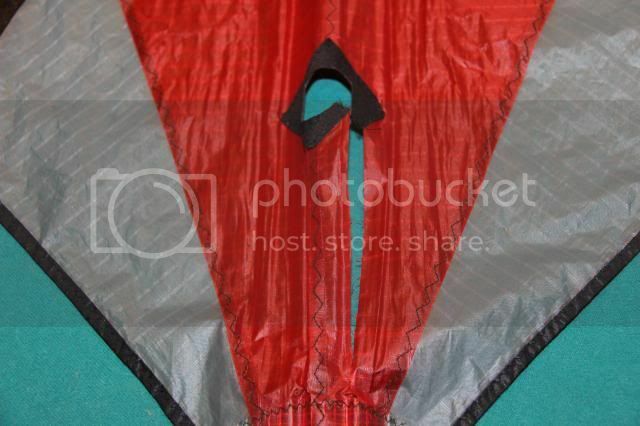 I've repaired similar tears on two kites with CA glue and clear tape on the back. In both cases the damage was caused by the combination of negligence by me in setting up or maintaining the kite and by nose plants by novice flyers. As this combination is rare and relatively easy to control, I figure these repairs will last just fine. Now that I think of it, on the Prophecy I added a glued down insignia tape patch around the center t hole. Weight on that kite wasn't an issue. I think the patch was really more for esthetics than added strength. The scar was ugly. I think that might be my next step. In both cases the damage was caused by the combination of negligence by me in setting up or maintaining the kite and by nose plants by novice flyers. As this combination is rare and relatively easy to control, I figure these repairs will last just fine. I must say I was more perplexed by the crash than the damage. I was so cold that I didn't check my lines after unwinding. I just checked my lines now and there was a knot in them! Careless move but lesson learned! + 1, the best way for a proper repair is probably to change the red panel. Don't forget that these beautiful kites are no more built. Great collectors ! I think all Blue Moon repairs were being handled by Sky Burner... that's what I remember from KM's announcement of retirement. If you can't fix it with teldar, maybe Anthony could fix it for you. He's fixed stuff like that for me. Don't forget that these beautiful kites are no more built. Great collectors ! That was one of the first thoughts that went trough my head when I saw the damage! Thanks for all the advice. I emailed Ken who suggested using a dacron patch with a second one behind the center T. The main downside is the appearance. I really like the idea of replacing the Red P31 and I probably would do it with an applique technique. The main obstacle hear is do get the sail to lay falt so there are no wrinkles once sewn. I think the applique with spray adhesive will work. So the main issue is that there is no turning back once you start sewing! What I think I'm going to do is a simple fix first. 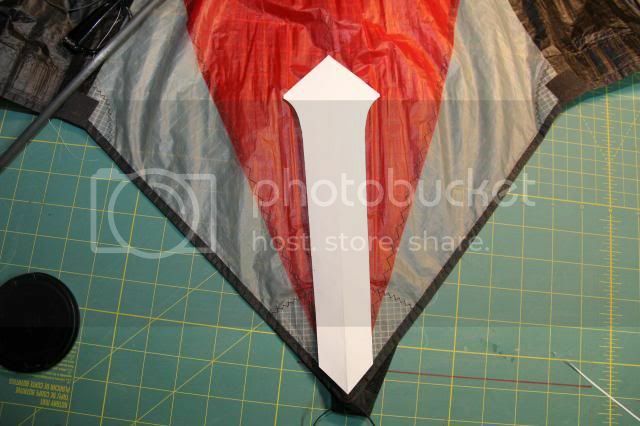 I'm going to use adhesive dacron or clear sail tape and fly it for a while and see how I like the look. If I'm unhappy then I will replace the Red diamond patch. The Stranger is a full 8' kite like the Mantis. The patch is 3" wide at the T and tapers to 1.5" at the keel. 2.5" would be fine at the T. I know Ken uses a patch on both sides of the sail at the T but I've not found that necessary with the long keel patch. 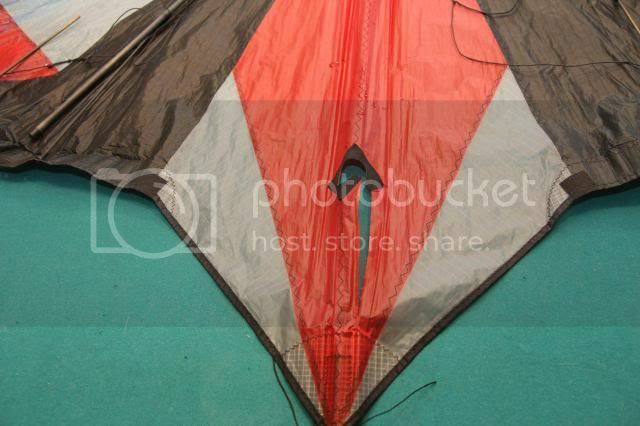 The hole cutout does not deform with the kite assembled. Your choice. I won't dissuade you from replacing the panel if you are set on that. Seam rip all the thread, stretch out the sail on the table, cut and tape a new panel on top, sew, cut out the old panel from the back. That is a big panel though so there are opportunities for challenges. Whichever way you go, the Mantis is a nice kite. Not the trickiest but a smooth flyer as are all Ken kites. Um ouch!!! Your on the right track with the dacron. I would use some Tedlar tape on the tear under the dacron anyway to hold it together well and some good seam tape on the dacron for extra good reinforcement. What broke? Btw when replacing full panels you have to be very meticulous when separating the taped seams or you stretch the material and it will never shape right again. Tape and a dacron patch is the best way to go. I'm convinced, No seams will be harmed in the repair of this Kite! I'm going to get some good double sided seam tape and try to keep the visual impact to a minimum.